Bryson City is a nice little town just outside Great Smoky Mountains National Park. One of its draws is Smoky Mountain Railroad and the steam trains one can take to and from the town. We were there recently on a Saturday. The historic downtown district was filled with families and children dressed in their pajamas — ready to board The Polar Express that evening. We were in town to try to get my vintage postcard book, The Blue Ridge Mountains of North Carolina, placed in a store or two. Sometimes we go into a store hoping to place it there only to be sent to another location. That is what happened in Bryson City. I thought perhaps the old N.C. Clampitt Hardware Company or the Ace Hardware would be interested in selling my book. I was told in each of those establishments that I needed to go up the street to Charleston Station and ask for Diana Clampitt. 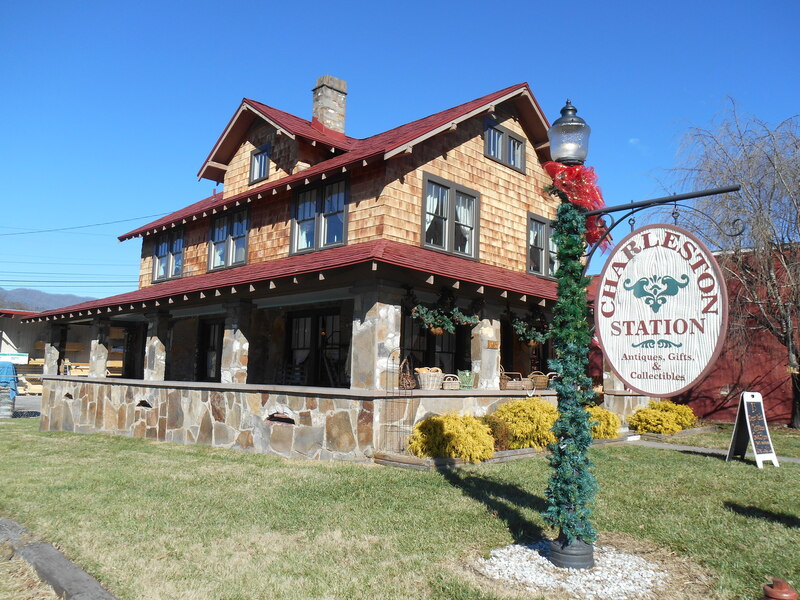 Charleston Station is an antiques and gift shop located in an old house. Ms. Clampitt is one of the owners of all three stores. She loved my book! She said she will order it in the spring for Charleston Station. She tries not to duplicate merchandise in the three stores. Charleston Station will close after the holidays for the winter and will reopen on March 18, 2015. Hopefully, my book will be available there when it opens for business then for the tourist season. My mom has me doing an Arcadia Publishing order! Your book is one of them! I am the daughter of the lady who owns Charleston Station, NC Clampitt Hardware, and Clampitt Ace Hardware… Best of Luck! She would love to have you do a book signing once we get the books in!! !